At ACS Data Recovery, we are experts at retrieving data from failed RAID arrays and file servers. It doesn’t matter what type of RAID you have, what configuration it is, or how many drives are utilized, we can recover the data. Professional RAID data Recovery services are highly specialized. In most cases, the recoverability of data hinges on what is done right after the array goes down. Attempting to rebuild or reinitialize the array after it goes down can often times lead to data corruption if the issue is related to a controller failure or some issue within the backplane. If the data is absolutely critical, the less you do to try and fix it on your own, the more likely that the data can be recovered completely intact. We can recover data from any type of RAID array. 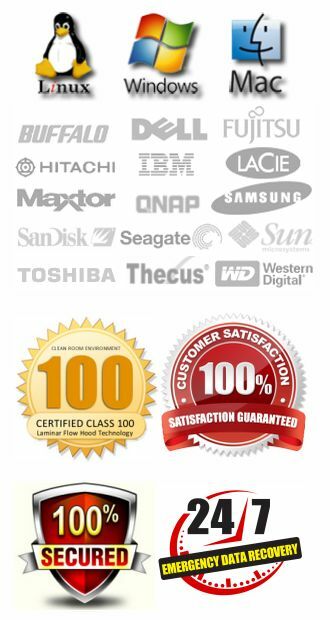 Since 2003, we have been a trusted leader in RAID Data Recovery services. We are fully aware of how critical your data is, and that is why we offer one of the fastest RAID data recovery services in the industry. With our standard service, we can typically have recoveries completed within 4 to 5 business days. Expedited jobs, can typically be completed in 24 to 48 hours. We’re even known to complete full RAID recoveries in less than 24 hours. I tried working out recovering the data from my raid 5 myself but was completely unable to get it done. I called places local to me and was only able to find one company that would even consider doing the data recovery. I could only speak to a representative who wasn’t able to do anything but ask questions. I called ACS and was able to speak to someone who did have knowledge and was able to answer questions and from speaking to him I felt as though it was possible to get the data back. I had the confidence that everything might work out. Luckily it did and I got all my data back in a timely fashion which saved me so much time on data entry for my customers and peace of mind. If I ever needed data recovery services again – hopefully I have learned my lesson and will not- I would definitely go with ACS. We routinely recover data from some of the complicated systems on the market. Got a failed Hitachi SMS file server? They don’t get much more complex than those…14 drives…RAID 6…atypical sector layout. Good luck finding a company that can actually recover data from one of those, but it is something we specialize in. We’ve even gone so far as to develop our own in-house software and specially programmed controllers that allow us to recover data where others have failed. 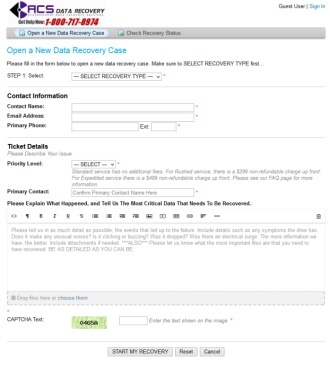 Our recovery process insures that your data is kept safe. We only work from imaged/cloned copies of the original source drives, so that no part of the recover effort will be detrimental to the data. Although RAID systems increase speed and are designed to protect your data, on occasion they do fail. If your RAID system has failed, we can help get your data back. We can successfully recover data from both spanned and striped configurations, from RAID 0 to RAID 5 and beyond. Expedite services are available for all RAID arrays. In many cases, where a RAID has suffered a logical or controller failure, we can have your data back to you within 24 hours of receipt. Additional expedite service fees apply, but when you need your data back, this is quite possibly the quickest service available in the industry. Our RAID recovery methods use a combination of hardware and software, and we take every precaution to make sure your data is totally protected. RAID data recovery can be extremely tricky, and before any recovery method begins, we clone or image each drive sector by sector. Whatever you do, do not let anyone run any type of recovery tool on a RAID system. Just one mistake can cause a total loss of your recoverable data. Why Choose ACS For RAID Data Recovery? All drives are cloned sector-by-sector, so there is no chance of any additional data loss. We cannot make the situation worse during our recovery attempt. We sign additional confidentiality and non-disclosure agreements whenever required. Recovery lab is biometrically protected to keep your data safe and secure at all times. If your RAID has failed, and it contains mission critical data, you must be extremely careful how you proceed. Running utilities, replacing drives, and trying to fix the problem yourself can sometimes have catastrophic results, which may ultimately render your data unrecoverable. Check for excessive heat. This causes many hardware failures. What Is RAID? You can find a more complete explanation HERE. A redundant array of independent disks, also known as redundant array of inexpensive disks (commonly abbreviated RAID) is a system of using multiple hard drives for sharing or replicating data among the drives. Depending on the version chosen, the benefit of RAID is one or more of increased data integrity, fault-tolerance, throughput or capacity compared to single drives. In its original implementations (in which it was an abbreviation for “redundant array of inexpensive disks”), its key advantage was the ability to combine multiple low-cost devices using older technology into an array that offered greater capacity, reliability, speed, or a combination of these things, than was affordably available in a single device using the newest technology. RAID configurations are one of the more tricky to recover data from mainly because your data is spread out among multiple disks which are typically configured as a single logical unit. Stripes data at the bit (rather than block) level, and uses a Hamming code for error correction. The disks are synchronized by the controller to run in perfect tandem. This is the only original level of RAID that is not currently used. Extremely high data transfer rates are possible. Uses byte-level striping with a dedicated parity disk. RAID 3 is very rare in practice. One of the side effects of RAID 3 is that it generally cannot service multiple requests simultaneously. This comes about because any single block of data will by definition be spread across all members of the set and will reside in the same location, so any I/O operation requires activity on every disk. Uses block-level striping with a dedicated parity disk. RAID 4 looks similar to RAID 3 except that it stripes at the block, rather than the byte level. This allows each member of the set to act independently when only a single block is requested. If the disk controller allows it, a RAID 4 set can service multiple read requests simultaneously. Extends RAID 5 by adding an additional parity block, thus it uses block-level striping with two parity blocks distributed across all member disks. It was not one of the original RAID levels. RAID 6 is inefficient when used with a small number of drives but as arrays become bigger and have more drives the loss in storage capacity becomes less important and the probability of two disks failing at once becomes greater. RAID 6 provides protection against double disk failures and failures while a single disk is rebuilding. In the case where there is only one array it makes more sense than having a “hot spare” disk.